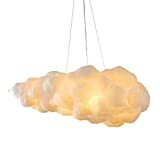 The cool new Kelopak Pendant Lamp from designer Budiman Ong may look like a fluffy cloud hanging down from the ceiling, but upon closer inspection is unexpectedly crafted from zippers. 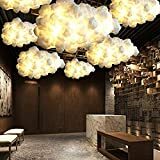 A unique way to add serene illumination and atmosphere to any room in your home or just flick the lights on and off to simulate a lightning storm. Available in two sizes. Size Small: 16" x 16" x 8"
Size Large: 26" x 26" x 13"